If you live in Maine, you likely enjoy the change of seasons. And although you may get your share of ice and snow, you must also consider a roofing material that can stand up to salt air and summer heat. Metal roofing offers the perfect solution for Maine residential and commercial applications. Besides the cost efficiency and energy savings, a metal roof allows snow to remove itself from the roof faster than traditional asphalt shingles. Energy efficiency resulting in lower heating and electricity costs. Many of our products further qualify for the Energy Star tax credit. Strong and durable with a long life-span. Most of our products include a 30 to 50 year warranty. Resistant to wind. Able to withstand speeds of up to 120 mph. Made with approximately 56% of recycled metals. Looking for metal roofing in Maine? 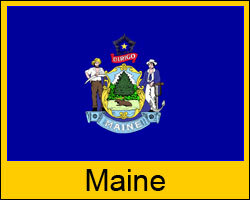 Our company services the entire state of Maine and will deliver your order directly to the work site. Simply contact our customer service team who will not only help you place your order, but will be there to provide assistance until the project is complete. Click here for shipping details and pricing information. We serve Caribou, Portland, Bangor, Lincoln and every Maine town and community in between!